STRYKES FEAR INTO EVERYTHING ELSE The all-new Stryker by Star Motorcycles is the coolest bike to roll off the assembly line since the Raider took the industry by storm. With its raked out front end and "fists in the wind" riding position, this bike is pure attitude. And with fuel injection, a 1,304 cc v-twin, and a beautiful final belt drive, the Stryker churns out plenty of low-end torque that gets to the ground in a very satisfying way. It's time for an attitude adjustment! Stryker delivers handling unmatched in this mid-size custom cruiser segment. And the steering head that is visible on this double-cradle steel frame helps give the bike its lean, lightweight image. 80-cubic-inch (1,304 cc) liquid-cooled, single overhead cam 60-degree V-twin with dual counter-balancers offers plenty of smooth performance. 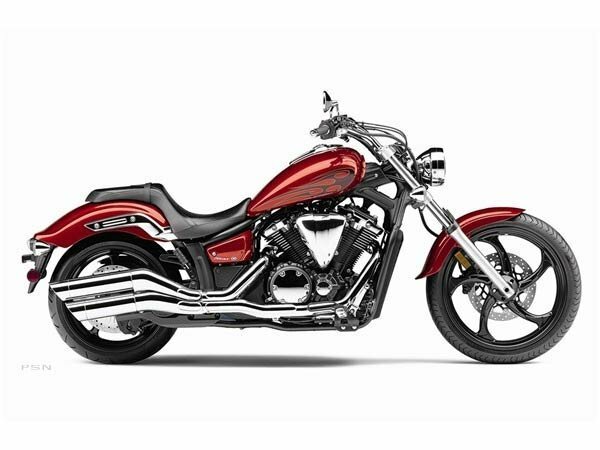 New exhaust system, designed specifically for Stryker, adds to the awesome look of this bike while also optimizing its engine performance––and it has a magnificent exhaust note. A muscular, forward-lunging look reinterprets iconic custom “chopper” styling for 21st century. High-end looks without the high-end price tag. No cheap plastic fenders here – this authentic cruiser has the real steel fenders customizers love. Classic belt drive, too.